Bangladesh Bank job circular 2017 for the post of officer. Bangladesh Bank is the central bank of Bangladesh. This bank handle and control all kind of finical activity of banking sector of Bangladesh. It’s our dream to become a part of the bank. The bank has given us a great opportunity by publishing a circular. If you are looking for a job in banking sector, this job is perfect for you. Educational Qualification: Applicant should have Masters degree or Four year honors degree from a reputed university. They have to minimum One first class/division. Third class / division in any examination will not be able to apply. More information about the job is given below. Application process: Applicants can apply through online application system of Bangladesh Bank. 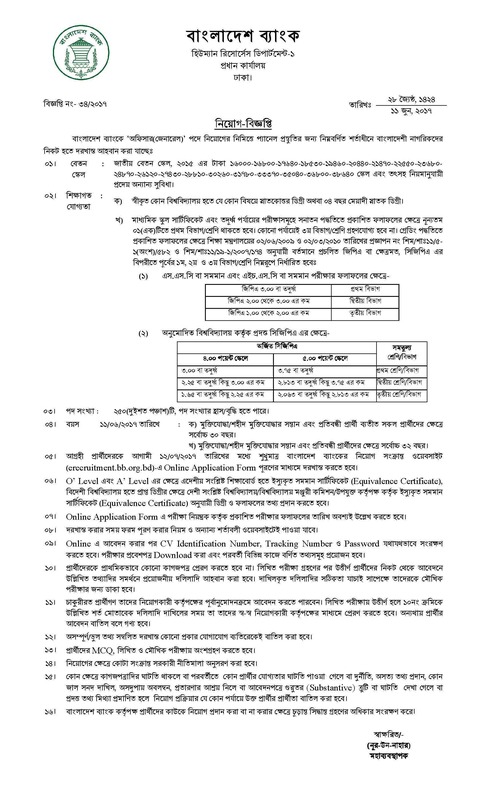 Click here to apply for the post of Officer (General) of Bangladesh Bank. Before application please scan or print Passport size photograph and signature. After application, save your Application tracking number, CV identification number and password. These will help you during printing admit card and other relevant work. Applicants no need to send any document. After qualifying written examination, candidates have to submit their necessary educational and other documents. After verifying the document eligible candidates will call for viva examination. Please don’t provide any wrong information and don’t create or register any second/duplicate account to the Bangladesh Bank E-recruitment system. If so they may reject your application. Applicants have appear MCQ, Written and viva examination. After getting examination admit card, save it for further use. You may not be able to download your admit card later. If this post is helpful for you please share this with your friends.